Should states increase funding for public schools? A wave of public school teacher protests this year swept through six of the states where educators are paid less than the national average and their inflation-adjusted salaries are lower than before the 2007–09 recession. Lawmakers made concessions to the demonstrators, but some labor experts predict more teacher protests after the new school year begins. 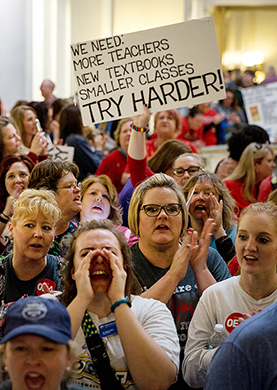 The protests reinvigorated long-running debates about how best to pay teachers, whether increasing school spending would significantly improve student achievement and whether school voucher programs should continue to expand. The demonstrations also inspired many teachers around the country to run for office in November's local, state and congressional elections or to campaign for candidates who support higher teacher salaries and increased spending on school supplies, support staff and infrastructure. Meanwhile, many experts question whether teachers unions can harness the protest movement's momentum to increase membership and political clout: The Supreme Court in June ruled that public-sector unions, including those representing teachers, could no longer collect fees from nonunion members working in unionized workplaces.